Two new mainstream AMD processors have been spotted in the Geekbench database. AMD’s Ryzen 5 2500X and Ryzen 3 2300X have appeared within the benchmarking software, implying a release date for the budget-friendly processors may be close. The Ryzen 5 2500X will slot just below the Ryzen 5 2600 in the current second generation Ryzen 2 lineup as the direct successor to the Ryzen 5 1500X. According to the Geekbench entry, this processor will feature four cores with simultaneous multithreading enabled for a total of eight threads, and feature 16MB of L3 cache, and feature a 65W TDP. Want the finest red team silicon in your gaming rig? Here’s the best AMD CPUs for gaming we could get our hands on. As the replacement for the budget-oriented Ryzen 3 1300X, the Ryzen 3 2300X will feature just the straight four cores without the doubled thread count. It also is listed to come with half the L3 cache, at 8MB, and a TDP of 65W. This will also be the first 2000-series Ryzen 3 chip that doesn’t come with integrated Vega graphics on the same package. As for clockspeeds, the Geekbench entry (reported by Sweclockers) indicates a base clockspeed for the top-end chip at 3.6GHz, and a boost of 4GHz. The Ryzen 3 CPU, however, will feature a base clockspeed of 3.5GHz and a boost of 4GHz. That’s quite a considerable bump for both chips from their first-gen AMD Ryzen predecessors, which both topped out at 3.7GHz boost. 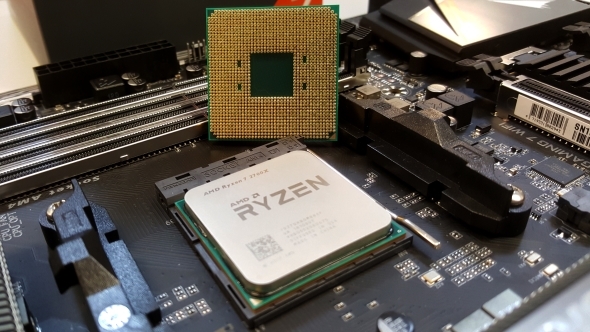 Both processors will be making use of the 12nm process – indicated by the bump in clockspeed – which has also been rolled out with the other AMD Ryzen 2 processors that launched earlier in the year. This will alsobring with it the improvements to the SenseMI technology package, such as Precision Boost 2 and Extended Frequency Range 2 (XFR 2), to help keep clockspeeds higher under heavy load. AMD have included coolers in the box with all of the Ryzen 2 processors so far, so there’s no reason why that wouldn’t carry on with these two processors too. The Ryzen 5 2500X may well come with a Wraith Spire (without RGB lighting) – as was included with its first gen predecessor – and the Ryzen 3 2300X will likely come with the Wraith Stealth. It seems fitting that the launch of these new entry-level processors will coincide with the release window of the cut-down budget-friendly AMD B450 motherboards – which were commonplace at Computex. That means we can potentially expect AMD to launch the Ryzen 5 2500X and Ryzen 3 2300X sometime at the end of July.